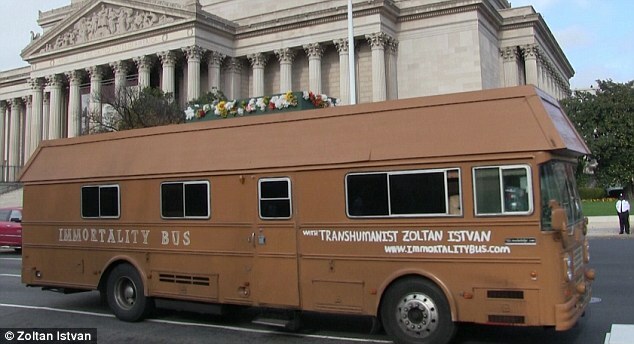 Mark O’Connell of the New York Times Magazine has written a feature-length story about Zoltan Istvan’s 2015 Immortality Bus tour, entitled “600 Miles in a Coffin-Shaped Bus, Campaigning Against Death Itself”. One noteworthy excerpt discusses the Transhumanist Party’s opposition to the unacceptable existential risk of nuclear war – a stance that the U.S. Transhumanist Party has strongly reaffirmed during its first platform vote in January 2017. Just past the security checkpoint at the entrance to the facility, there was a kind of open-air munitions exhibit that featured a squat replica of the Fat Man, along with dozens of other decommissioned rockets and bombs. In the undulating heat of the desert, these slender tilted obelisks loomed like the inscrutable monuments of an ancient thanatopia, a henge of metal phalluses thrusting skyward in ecstatic communion with the cosmic powers. Istvan removed from his backpack a banner he had printed for the occasion and, positioning himself in front of one of the larger rockets, instructed Horn to take a series of photographs of him bearing the rolled-out message: TRANSHUMANIST PARTY PREVENTS EXISTENTIAL RISK. The intention of the protest, if you could really call it that, was to create a series of images and short videos to be uploaded to Istvan’s various social-media accounts and shared among his many thousands of followers. Leaning self-consciously against the Fat Man replica, I scribbled in my notepad. Horn took out his phone and filmed a six-second Vine video of Istvan saying: “Stop nuclear war! It’s a devastating existential risk!” Then he filmed Istvan giving another brief speech on the central theme of his campaign: the need to divert government spending away from war and into research on life extension.